Purpose, Meaning & Happiness on the Camino. Also, why is there a bullet hole in this road sign? At a recent conference (forgotten which one exactly) the speaker said something along the lines of; “having purpose and meaning are the main things that lead to long-term happiness in life”. He also added that “if you achieve this sort of happiness you can tolerate all sorts of hardships and frustrations”. These thoughts resurface during my cycle ride along part of the Camino de Santiago in North West Spain. Don’t worry, I’m not about to go all spiritual and ‘Zen’ on you. I just thought it was interesting to reflect upon this and some of what I observed on the Camino. Camino Pilgrims are extremely happy people. Obviously with the exception of my cycling companion Geof, who loves being grouchy. Pilgrims stride purposefully along the path with euphoric smiles and greet strangers with ‘Buen Camino’ (good road). You might expect this from people who are on a pilgrimage to a site of religious significance, but surely not everyone? I think the source of their happiness has something to do with purpose. Depending on where you start, the Camino de Santiago can be 1000’s km long; the French Camino route we were cycling is 780km. It’s a long distance and having a very clear ‘purpose’ to complete the walk is likely to feature greatly with people. Perhaps this is why they are so happy? One other thing. There is nothing like racing downhill at 45kmh on your bicycle, passing a pilgrim on foot. Not sure what that does for their happiness, but it certainly cheered up Geof, bellowing ‘BUEN CAMINO…….’ as he sped past. Camino Pilgrims put up with great hardships. After 30km of slogging it along the dusty road, carrying your belongings on your back, in all sorts of weather, scorching heat, torrential downpours, wind, snow and sleet……spending the night in feather bed luxury is just what you need. Sadly this isn’t the case for most pilgrims. The accommodation is usually an Alburgue or refuge. These are very basic places, what would you expect for a few Euros a night? Maybe this substantiates the idea that if you are deeply happy (fueled by purpose and meaning) you will tolerate all sorts of hardships. Obviously you don’t have to stay in Alburgue. You ‘gets what you pays for’ and there are plenty of decent hotels along the route. I should probably be ashamed of myself for saying this but, I did like the ones that gave complimentary use of the minibar for ‘pilgrims’ (just show your credentials). Camino Pilgrims look lost at the end of the road. I reckon this is a difficult thing for many pilgrims. 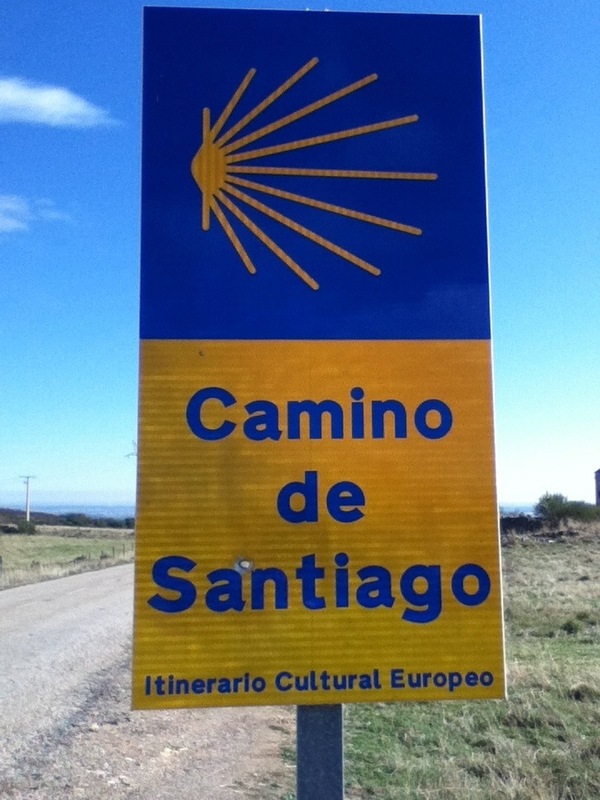 On reaching Santiago de Compostela, and achieving your goal, what happens next? You no longer have a ‘purpose’ in life. This may bit melodramatic, but it was interesting to see people wandering around aimlessly after the initial euphoria of arriving in Santiago had worn off. One chap with a large beard (there are oh so many of them), was loudly and proudly proclaiming on Wednesday afternoon “I walked 1000km to get here…..” Thursday afternoon he looked completely lost, in every sense. I wonder if this is where some of those epic ‘walk around the world’, ‘I jogged home to Tonmawr from Tibet’ journeys come from? People found happiness with a purpose (walking somewhere) and just needed to keep on walking. Basic law of the Universe. In rural areas where people have guns, the road signs get shot. Simple. Some of the people who live alongside the Camino never actually get to walk it for any distance. As a result they lack purpose and meaning in their lives, are unhappy and engage in random acts of vandalism (shooting road signs). Please suggest your own theories in the comments. Achieving long-term happiness may well have a lot to do with having a purpose and meaning to what you do. If you are happy, it probably is easier to tolerate hardships and frustrations. Beware of the void once your purpose has been achieved. The ‘what’s next’ can be a very challenging question. So very true, it’s all about direction, walking the camino gives structure to people’s lives. Take that away and we struggle.